Little girls are the apple of their parents eye and they deserve the best! So if your lovely daughter’s birthday is coming up, it may be time to get a little creative and throw a super bash. Instead of going for run of the mill birthday parties, why not throw a princess theme birthday party? They are perfect for girls aged 4 to 10, although some older girls may also like a princess theme birthday party. From Princess Theme Costumes to Party Supplies ranging from balloons to party kits, we have them all to make for a memorable birthday bash. You could go all the way and decorate your place with pink balloons and confetti, arrange a princess inspired dinner table and dress your little darlings in Princess theme costumes. Speaking of costumes, lets take a look at the best costumes that will transform your girls into royalties. Reel life to real life, Disney movies have never disappointed when it comes to looking for inspiration for Kid Costumes. Even today, Disney holds a special place among children for their movie magic, which advocates for strong morals, bravery in the face of terror and always staying true to yourself. Princess Tiana from The Princess and the Frog and Princess Merida from Brave are some of the few that have become quite popular among the girls. Strong, fearless and independent, they mark a shift from the traditional damsel in distress. You can go for these new age princesses or if you prefer the old-favorites, then you just can’t go wrong with Cinderella. Who can forget the lovable Rapunzel from Tangled? Overcoming her fears and finally setting out into the world she has been taught to fear. A lovely message for all young girls. In hues of purple and violet, this dress is a favorite among the girls. It includes only the dress and does not come with any accessories. You can’t be a princess unless you have your own crown. A tiara is after all a princess’s most prized possession. This beautiful gold-purple tiara will add a touch of authenticity to the outfit. Her Royal Highness will thank you endlessly for bestowing this great honor on her! Tiana, the fiery, independent Afro-American woman who lived as per own rules is a strong role model for today’s young girls. 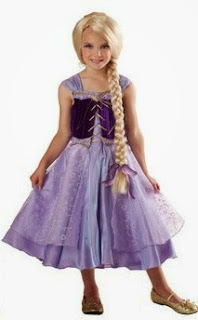 If you want to go for this costume, it is available in 3 sizes- Toddler, Small and Medium. No princess theme party will be complete without Cinderella, the ultimate Disney princess! This sky blue gown is extremely pretty and feminine and is a good choice. 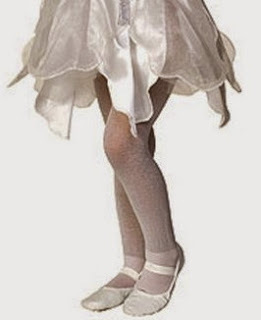 You can even accessorize this Cinderella costume with a pair of white tights. 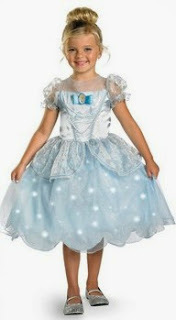 Sky blue gown with white tights, your daughter will look radiant and spectacular for any party. Single pair of white sparkle tights that will make your Cinderella appear more modern and chic. It does not come with the slippers and skirt that are shown in the picture. Plan the ultimate princess theme birthday party for your toddlers. Toddler girls while not as informed about the different princesses as their older counterparts, are nonetheless excited about dressing up as a royal figure. Choose from everyone’s favorite Shazadi Jasmine or go for the French royal, Princess Belle. Belle, the village girl who defied societal norms and carved her own path is a favorite among feminists. The woman who ultimately transformed the beast with her love is also a children’s favorite. 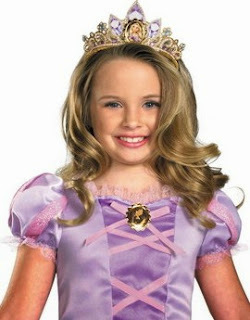 If your toddler happens to be one of those children, go for this Belle Deluxe Costume. It includes the dress with petticoat and headpiece. A nice pink, Fairy Princess Costume is always a good choice when it comes to fussy toddlers. 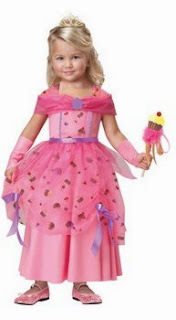 Frilly and bright pink and with a pretty wand, you just can’t go wrong wit this costume. It includes a dress, belt, wings, wand, skirt, stole, fingerless gloves, and tiara. Shoes are not included. You can compliment the fairy costume with a nice Pink Princess bag which can hold a quite a bit of stuff. 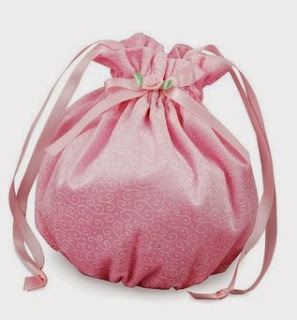 A pretty drawstring ribbon bag, whose pink color will make it a favorite among the girls; a very useful costume accessory. As the beautiful princess of Agrabah in the Aladdin movies and TV series, Princess Jasmine is hugely popular among kids. You could dress your toddler up as this beautiful Arabian princess and let her have the time of her life. This costume includes a dress and headband. 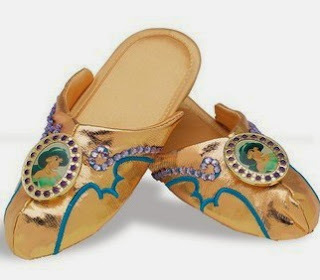 Accessorize the princess Jasmine costume with a pair of golden slippers. The authentic looking Arabian footwear will compliment the overall look of the outfit. A pair of gold fabric slippers with Jasmine cameo and fake jewel accents. One size fits most children. Now that we are done with the costumes, lets take a look at the things that are needed to make for a rocking party. Balloons, princess theme plates, glasses, napkins and what not are just some of things that can transform any room into a scene straight out of a fairytale. No birthday party, be it princess theme or any other can be complete without lots and lots of balloons. 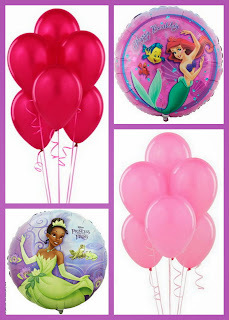 Choose from printed foil balloons depicting your favorite Disney princess or go for simple colored balloons that will create the right party atmosphere. If you are doing something, do it all the way or don’t do it at all! 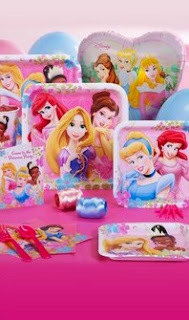 No princess theme party will be complete without matching tableware. 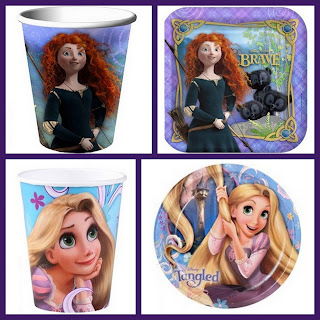 Choose from princess theme plates, cups, spoons, knives and a whole lot of matching tableware. If buying individual party decorations seems like too much of a bother, go for this amazing party kit. These are extremely convenient and will save you the hassle of going for some last minute shopping for ribbons or balloons or anything else that you might have forgotten. Standard Pack for 8 includes: 8 invitations, dinner plates, dessert plates, cups, forks, spoons, 16 napkins, solid-color tablecover, foil balloon, 12 balloons (2 colors), curling ribbon (2 colors), crepe paper rolls (2 colors), and cake candles. Standard Pack for 16 includes: 16 invitations, dinner plates, dessert plates, cups, forks, spoons, 32 napkins, solid-color tablecover, foil balloon, 12 balloons (2 colors), curling ribbon (2 colors), crepe paper rolls (2 colors), and cake candles. These are a few ideas to get you started on how to throw the best birthday party that your daughter can possibly have. Try to be a little creative and innovative and you may end up with a cherished memory that your daughter will never forget. Wishing you the very best of luck!